There are many reasons why you may want to move a participant from one group to another, but you may be hesitant to do so because you're worried about losing the students progress. In this article you will learn how to move a participant from one group to another, and how to transfer their progress data as well. Note: It's important to note that if the new group is mirrored in other locations the participant will be put moved the new group in those locations but their data will not transfer with them into the new group. 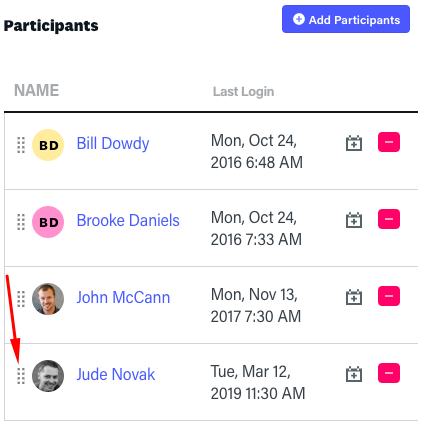 From the enrolments tab, open the group you want to move your participant from and also the group you want to move them to. Select the drag handle next the participant you want to move and drag the participant to the new group. If the user has tracking data you'll see the message below. If you want to move the data to the new group check that the 'transfer tracking data' toggle is on and click the button that says 'Move this user to the new group'. If you don't want to transfer the data simply toggle the switch to 'Don't transfer tracking data' and click the 'Move this user to the new group' button. If the user doesn't have any tracking data, you'll receive the message below. Click the button that says 'Move this user to the new group' to move the user. Click cancel if you don't want to move the user.